This TotT article will focus on rain boots. While flashlights are indispensable for tunnels, respirators are indispensable for abandoned buildings, creeks are insufferable without rain boots. It’s funny, because I’ve heard from more than one person that we’re “lucky” to have water proof shoes for doing creeks. Hmm… I don’t know about luck, but I do know that I can go to any hardware store and get some water-proof rain boots for $20. It’s surprising to me that this isn’t common knowledge – if you’re going to be going into creeks, why wear anything else? But besides just buying rain boots, there’s some other things you might want to take into consideration. First, get the right size. You might want to spend some time hitting up a few different stores to find the boot that’s the tallest. Though I just got some random ones from Home Depot, my friends are actually an inch taller. While an inch doesn’t seem like much, when you’re in a creek it’s a huge difference. In at least one case, that extra inch allowed him to tip-toe through some high water and continue down a tunnel. If I had tried, my boots would have flooded. So it’s pretty important to get them as tall as possible. After wearing boots all day, your feet will be killing you. One problem with boots that are too small – they’ll scuff the sides of your feet and chew them up good. 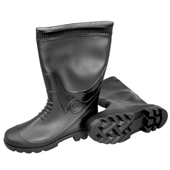 The boots are really just rubber cast in a mold, so there’s no padding or comfort built in. If you can handle it, buy bigger than necessary and wear some thick socks. Another way to increase comfort seems pretty obvious, but might not occur to you: get some Dr. Sholls shoe inserts! After I got some shoe inserts, the flat, hard bottom of the boots how had a lining like a sport shoe. It made them much more pleasant to spend the day in. To recap, you want the tallest boots possible, with plenty of room inside. Upgrade them with shoe-sole inserts, and don’t do creeks without them!